Our team is happy to announce that CircuitLab is now available offline! Since we launched CircuitLab, the ability to use the tool offline has been one of our most requested features. With CircuitLab's offline capabilities, you can now design, simulate, and save your circuits while you are disconnected from the internet. Once your computer comes back online, we will sync all your circuits with your account on our server. To read more about how you can use CircuitLab offline, visit our blog post about the feature. Other new features since our last newsletter include dramatically improved loading time, numerous bug fixes, improved diagramming heuristics, and new search functionality on the Tool Box to make finding parts easier. 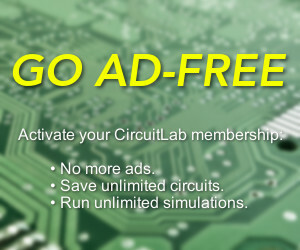 If you haven't tried CircuitLab recently, take it for a test drive: https://www.circuitlab.com/. We want to know more about who our users are so we can make CircuitLab better. Please take a few minutes to fill out a couple of brief anonymous surveys. Visit our blog for more details! Practical Electronics for Inventors - 1000+ pages from basic transistor circuits to op-amps, digital logic, motor control, component selection, and how-to prototyping tips. Paperback and Kindle. The CircuitLab team is excited to announce a new partnership with UBM Tech, the electronics industry-leading resource for essential business and technical information and the parent of leading publications including EETimes and EDN. We are looking forward to working with a partner that supports our mission of making powerful, easy-to-use tools available to everyone, and will enable us to continue to deliver and grow a great software experience to our ever-growing community of CircuitLab users. DESIGN West / ESC - The Embedded Systems Conference is the global electronics industry's leading event. With inspiring speakers, hundreds of technical sessions and workshops, case studies, and the opportunity to get some serious hands-on training, ESC is the place to be for the design engineering community. Register today with promo code CIRCUITLAB for your FREE expo pass. Advanced rates are now available saving you $300 off registration. We'd like to take this opportunity to thank you for being part of our community of users. It is only with your continued support, advice, and feedback that we have been able to grow our community and provide you with a tool you love to use. Today more than 70,000 people use CircuitLab every month, and you, along with your fellow CircuitLab users, now run more than 100,000 simulations every week (that's one every 6 seconds!). We look forward to continuing to build more of the features you want, and continuing to serve all your electronics design needs. To get all our news as it happens, make sure you to check our blog (http://www.circuitlab.com/blog/).